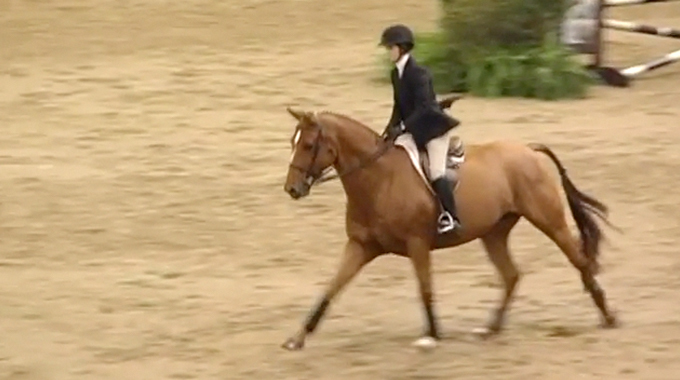 I have a warmblood that has come to me for retraining over fences. He was jumping 1.4 meters. His problem was he would not use himself properly on the flat and over the fences. On the flat, his head was high and he wasn’t engaged from behind. 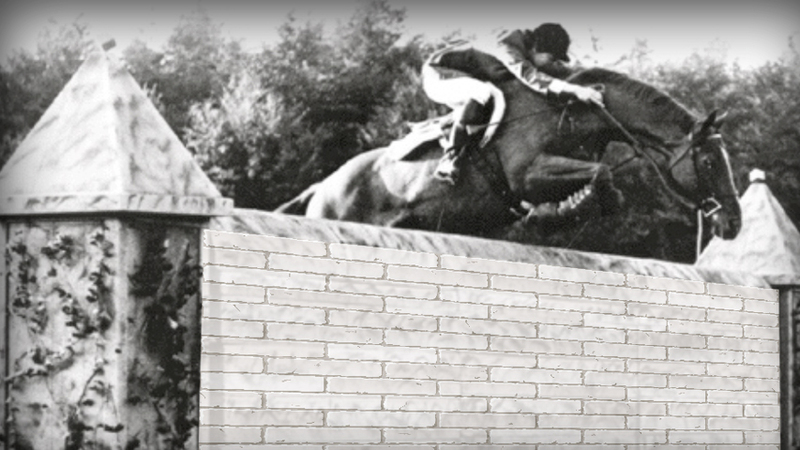 When approaching a fence, he would get above the bit on the last two strides, string out, and lose further engagement from the hind-end which caused problems such as jumping flat, heaviness on the back side, and inversion in the back. I have worked on correcting this problem by reducing the size of the jumps to 18″ inches, softening the mouth, dropping his head long and low, and moving him into the bit. Regarding his fence work, I employed cantering him to the fence and then asked for him to trot before he reached the fence so that he is comfortable accepting contact over the fence and relaxes more when approaching the fence. I also employed turning him over the 18 inch fences, which seemed to help him. Lots of progress was made, so after a warm-up, I placed him over 1.10 meter gymnastic line in which we rode 3 times and each time he showed improvement in the bascule and a lesser desire to get above the bit. However, the following day, I noticed his back was sore. Since this is the only ride in which we have rode a larger fence, I suspect his back was probably already sore and the larger fence exasperated the pain. Interestingly enough, he never complained with ear pinning, saddle cinching, or tail swishing, but I suspect his former approach to the fences was a result in pain or anticipated pain. I contacted the owner to see what saddle she was riding in, and the saddle fit seemed appropriate. After more questioning, the owner did share that sometimes when grooming the horse would stomp, lift his head, and she attributed this to the brush being too rough. Needless to say, we pulled the horse from work until the pain is resolved. My question is more of a general one regarding back pain and jumping. Since this horse had a two year history of on and off jump problems, I suspect the habits of not engaging from the rear, elevating the head, and jumping flat over fences may have caused chronic back pain and thus began a vicious cycle. I don’t have the experience of retraining horses with back pain, so I don’t know if my evaluation is correct that improper form over a period of time will eventually cause chronic pain. It would seem to me that the desire to create bascules is to prevent back injuries such as kissing spine. I would like to know, if in your experience, my theory has any merit to it? There are clearly many variables such as conformation, conditioning, strength, rider interference, etc.—but the scenario made me wonder if improper form on the flat and over fences will only affect some horses. I ask this as I see several horses riding with styles that appear to be hindering a quality jump, so I’m wondering if these horses are used regularly for jumping and doing so improperly, will they eventually develop back pain as well? Or are there other factors that are stronger influences to back pain—such as lack of strength and conformation? Your question is a complex one and one that is in the minds of many good horsemen when horses are not going as well as we would like. Since horses can only convey how they feel through body language and their attitude during and after work, we are often at a loss to know exactly what is going on. The body is complex and often a problem that originates in one area is only visible to our eye when it creates a problem in a different area. The musculature, especially in the back, is difficult since it is impacted by both the stress of more or different work, as well as by the way of riding and training. 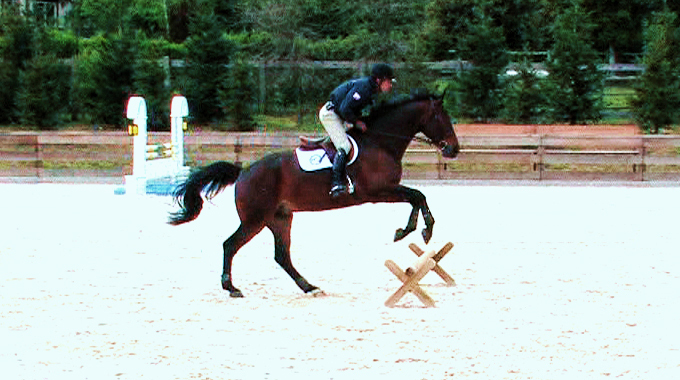 Horses that are worried about jumping often begin to ‘rush’ to the jumps in an attempt to get away from a rider’s interference, or even a general lack of confidence. When horses hurry the last few strides, it quickly becomes habit for the horse. Like any habit, changing it takes far longer than creating it in the first place! I’m particularly impressed with how you dealt with this issue. 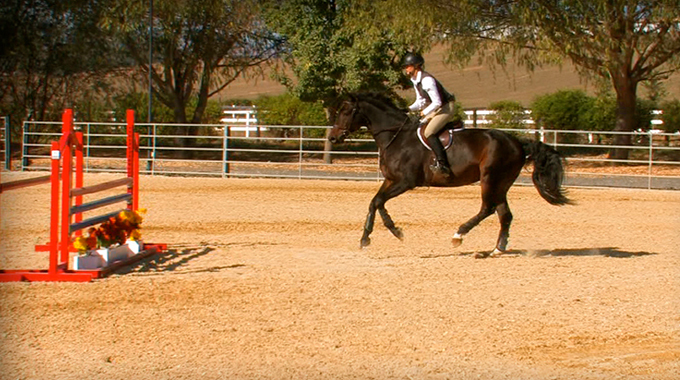 Cantering toward the jump, and then doing a quiet and organized transition to trot just before the point the horse typically rushes, is my favorite exercise for this problem. 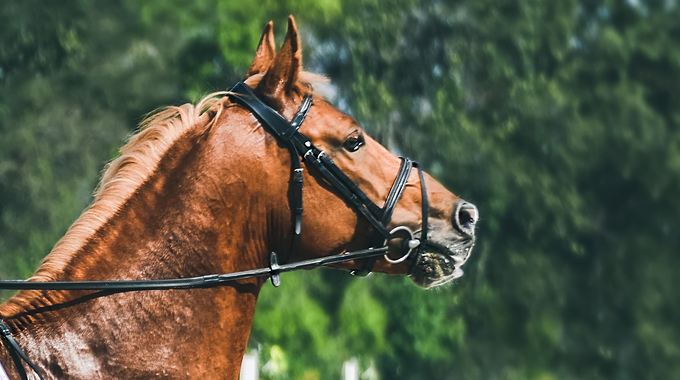 Adding smooth and soft turns over the jump, first from the trot and then in canter, is a great next step for the horse to learn to listen for your direction rather than hurrying the process and rushing off after the jump itself. As to your horse feeling different after a somewhat larger school, just as you’d feel the difference if you went from simple exercise directly to significantly more strenuous training, your horse is liable to feel the same. I prefer to build up from starting your gymnastic very low each day with a gradual raise and spreading of some or all of the jumps to the point the horse is trying a bit but still comfortable. It is a good idea to finish with one time through the line very small again so that your horse returns to the barn with a feeling of success rather than a big effort. With a horse that tends to have some muscle soreness, I like to do some jumping most every day, even if it is just ground poles, and put a flatwork day in between two real jumping schools. 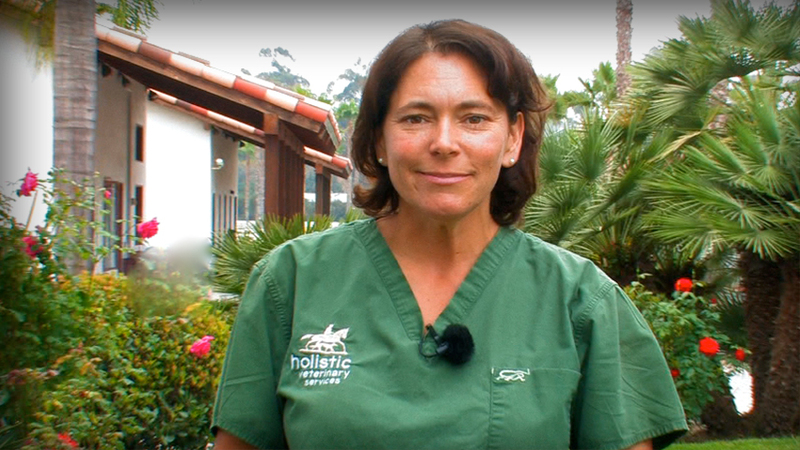 Just as human athletes use this technique of doing different work on alternate days, note that, unless a real injury is involved that will only heal with total rest, giving a horse a total rest is not in their best interest. This is especially true with horses that are stabled for all or most of the day rather than having significant turn-out time in a big enough area to be able to really move. Also spending time working ‘long and low’ at the beginning, the end, and during breaks in your training I feel does a lot for virtually every horse by stretching and strengthening the long muscles. With a horse that tends to hollow or invert their back, this is the place to use lots of leg to insure that your horse’s hind quarters work well under you while the back is stretched. Pay most attention to the motor under you rather than the head and neck in front. This develops the strength to use these muscles effectively when the horse is in his working posture for jumping. A final note on this topic: each individual horse has his own natural technique when it comes to jumping. Trying to insist a horse approach a jump with his head either lower or higher than is natural to him is often the cause of tension and resistance. Hunters need to gallop and jump in a particular style and it is seldom satisfying to either horse or trainer/rider to try to make a horse go in a way that is not natural to him. Jumpers are not bound to a certain style and some are very capable competitors even when their particular style is far from our “ideal.” Be sure that you work on balance and adjustability on the approach to the fence while allowing your horse to figure out what works best for him to deal with both tight and long take-off “spots.” As a horse’s balance improves and he learns the importance of landing as well as taking off in balance, the jump will also improve. 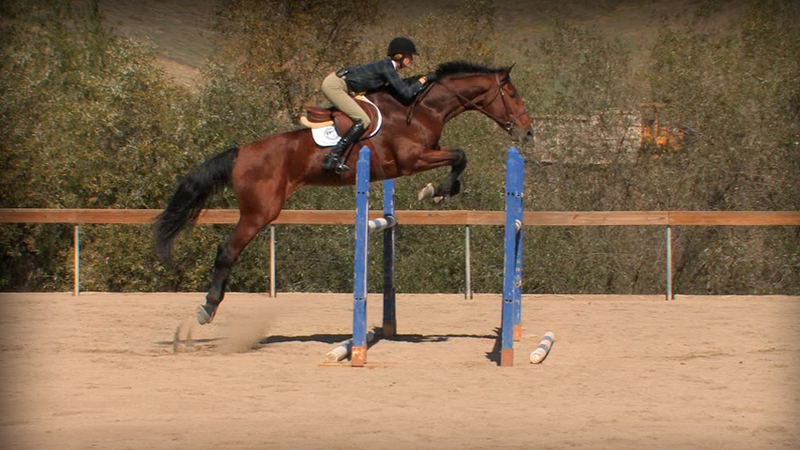 Virtually every horse can focus best on the act of jumping when he is in a focused yet relaxed state of mind. Either pain or irritation will only interfere—whether it comes from a poorly fitting saddle, too strong a bit, or a rider whose balance is constantly shifting at the wrong moments! I find it rather amazing that so many horses find ways to cope with discomfort and even pain. They truly are remarkable animals, generous in so many ways. Congratulations on being the sort of horseman that uses that all important “aid”—the one under your helmet! You are aware of every aspect of your horse and seek solutions that are most likely to benefit your horse. Not enough riders and trainers think in this way and are quick to go to more bit and/or draw reins for the quick, but temporary, fix.